Who said eating healthy meant deprivation? 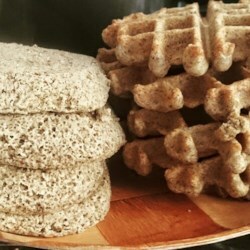 These fluffy gluten free waffles/pancakes taste as good or better than the others! It's a family favorite every Saturday morning topped with blueberries and walnuts at least. No guilt in eating two, but be warned, one will fill you up, so eat it slow and enjoy!